Regular readers may recall that Macro Man is a bit of a cycling aficionado. Occasionally, he tries to enroll the Macro Boys to come along with him, particularly Macro Boy the Elder, who has the perfect build for riding and has at some points shown some aptitude for it. Unfortunately, the lad's heart has yet to be captured by the sport, and so occasionally when your author tries to coax him into a ride the result is a sort of sulky tantrum of the type that 14 year old boys excel at. As Macro Man confronted another of these moan fests yesterday, his mind wandered to financial markets and the apparent onset of yet another market tantrum. While the ECB's "no soup for you" routine last week may be fingered as a possible catalyst, in point of fact the market generally tried to shrug off the weak US data well before then. While the short end isn't pricing anything like a done deal for a Fed hike by the end of the year, let alone September, even for the latter meeting the odds stubbornly refuse to move towards zero. Pricing for December, meanwhile, remains near its highest probability since the Brexit vote. The upshot is that fixed income securities of most stripes have come under the cosh a bit, with Bunds notably trading back to zero yield and US bond futures decisively breaking below the "corridor of uncertainty" highlighted in this space on several occasions recently. Technically, of course, this bodes for further losses ahead, all the more so because models will be hitting stop losses. There was a lively debate in the comments section a few days ago about the likelihood of a bond market crash, particularly in Europe; Macro Man deems it unlikely in the absence of a significant rise in inflation, but this of course does not mean that the market cannot trade lower, because of course it can. Indeed, for the moment this appears to be the path of least resistance. The repercussions for other markets are notable and obvious. Much of the current financial market pricing architecture has been built upon a foundation of very low interest rates, so of course any crumbling of that foundation has potentially significant implications. In the equity space, "bond replacement" stocks have been amongst the darlings of the year, at least until recently; as the chart of Altria indicates below, these have been taken to the woodshed, most particularly on Friday. Even after last week's carnage, it's hard to say that it's cheap with a P/E of 22 and little growth; the yield of 3.845 looks a little less tidy if 10y Treasury yields back up another 25 or 50 bps. On an index level of course, Spooz in particular look like a coiled spring whose potential energy is in the process of being transferred to kinetic (downside energy). We've seen this film a number of times before, of course, where stocks break down only for the doves to ride to the rescue. The question is whether we are at that point yet; it seems difficult to believe so in the absence of another few percent. That being said, we shall have an important litmus test today, when dove ne plus ultra Lael Brainerd gives a speech on the US economy in Chicago. If the Fed still wants to keep September alive, this is the last chance saloon to give the market a nod and a wink. Recall that the last few speakers from what might be termed the cabal at the center of the FOMC power structure (Yellen, Fischer, and Dudley) have all striven to keep the notion of near term rate hikes alive. While Brainerd may not be at the center of the group, her dovish views have been articulated in the FOMC's lack of action thus far in 2016. As such, if she were to tilt towards the sort of language that we've had recently from the cabal, that's as clear a sign as you could get that the times they are a-changin'...and we should expect more of what we had on Friday. If, however, she sticks towards her dovish views, it wouldn't necessarily derail the market's tantrum, but it could assuage it. Certainly the sharp rise in VIX will make it attractive for put holders to cash in if there's a signal that the Fed may capitulate to the market's tantrum yet again. Because ultimately, that's the conclusion if Friday's ructions are pushed to an extreme. The tricky bit, of course, is knowing what the Fed would describe as an "extreme"; naturally, there is a multi-dimensional matrix comprising economic momentum and financial conditions as measured by a host of variables (rates, the dollar, spreads, etc) which also must be tempered by balancing actual observations with forward looking forecasts. In short, Macro Man does not subscribe to the view that this is "the big one", but he does welcome a higher volatility environment as one that provides substantially greater trading opportunities. Gun to the head, he expects Brainerd to hold her dovish course and provide at least a temporary respite (though that could last only a few hours.) He may well look to cash in on some shorts to provide a healthy financial and mental platform from which to increase position sizes from more favourable levels. Either way, it looks set to be a more eventful period as we careen towards the election and the close of the year, for which we can all be grateful. I'm wandering whether there is an overall change of tack towards getting a bank rate to help support the yield curve, bank profitability and credit issuance and to try and support the economy fiscally. It's taken a long time to come to the conclusion that they need to do something else perhaps, as we end up with zombie companies and banks littering the landscape. Pain ahead is required, mixed with the emollient of fiscal spending/investment and rising regulated wages. Markets? It's a brave man who calls the end of the longstanding bond/equity non correlation, regular re-balancing model...but you know what, it would be quite interesting to see what happens to various models if that historic link is broken. Like your thoughts, well expressed, agree though less angsty than my version. If you can sell guaranteed capital losses to bond markets whilst pretending that the low rate policy isn't actually working and creating growth in excess of the yields on offer then you must have the ability to put something into the water. It doesn't work any other way ,because the recipient must either be wearing regulatory bracelets ,or be the product of one of those sperm that managed to wiggle itself past the womb test. The womb test that tries to spot the numerically inept ,or emotional basketcase and eject them down the nearest toilet bowl. As policies go I would have thought it was obvious that moentary policy implodes the moment particpants understand the irrationality of what's on offer. That is growth is working sufficiently well that rates go up (or just might go up) ,but you've bought at capital values that imply the opposite. Don't even try to find the pea under the shell because there isn't one under any shell. If you're also in a period where equity values had higher correlation to bonds than usual then that's not going to be good either. a lot of 'hindsight' talk already - who is actually short and killing it? Dont need much, maybe a few (2-4) billion of real money ...especially when most models step aside when extreme values are hit. Many of my stocks to watch are not extremly oversold yet, though by the end of today we shall see. Turn around tuesday seems like a perfect set up. Well, some of us amateurs have been awaiting this most of the year. I am still loading the sds pistol and have been patient. Does this really surprise anyone? We have patched together an interconnected world, that seems to work in good times. But the last 8 years have been sustained by credit, and the balance sheets of countries and individuals have not been fiscally sound. So what happens when a correction begins? Does the average American or European have much in common with the average Indonesian? Probably not much, so if corrections are about to begin the global interconnectedness will prove not durable. End of volatility suppression in the near-term? Gap and Crap part 2 dead ahead…. another tough morning for vol sellers. 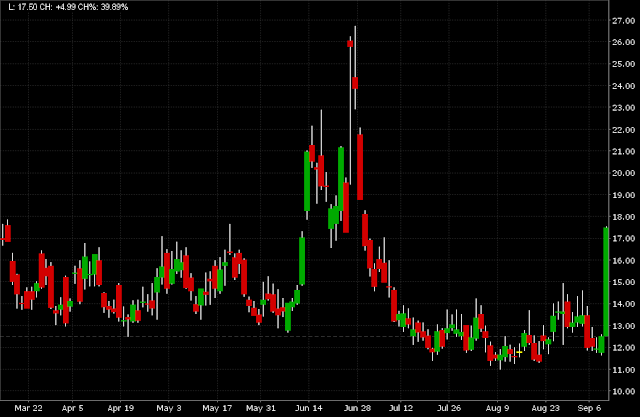 This market needs a good purge to cleanse itself of high stock-bond correlations and a massive short vol position. 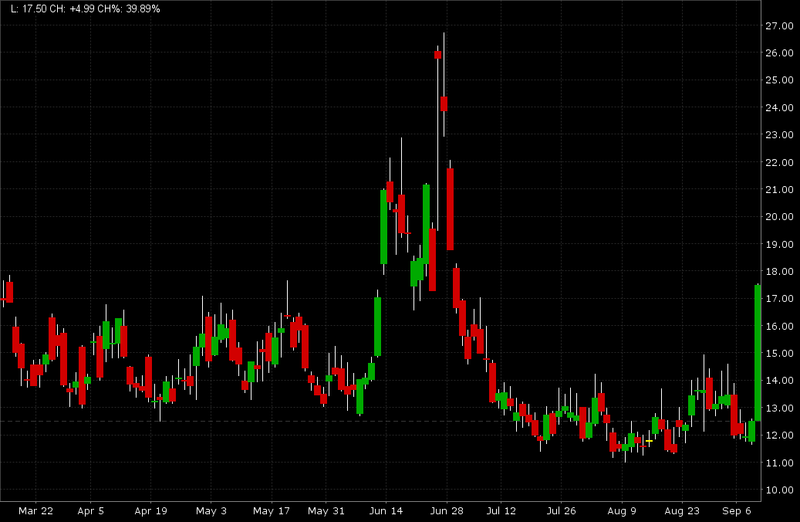 [We are long vix calls]. Agree with @crackerjack that rates are the key to this correction. Until bond yields stabilize, this will continue. @abee, thank you for color! Action in the bund not looking too bad. 3Y and 10Y UST auctions at 1:00pm EST followed by Brainard at 1:15 will be pivotal. Interesting obs on Vix for 12yo.. Looking ahead, though, my greatest concern does not center on policy mistakes from Europe or Japan. These guys have an established tradition of screwing up, and I have been out of the DAX and NKY trades since last December precisely for that reason. I’m also not particularly worried about some worthless broken trophies. My fear, as you may have guessed from all of the recent missives, is the post-Brexit rise in populist US politics. Free mobility of capital and labor looks to be increasingly under threat. Thus, the real return on developed-market capital (aka spoos) is becoming increasingly risky. And that of course comes at a time when accommodative Fed policies, which could be used to offset those lower real returns, are being threatened by the very same populist politics. Fed bashing, as I noted in last week’s commentary, is on a tear. 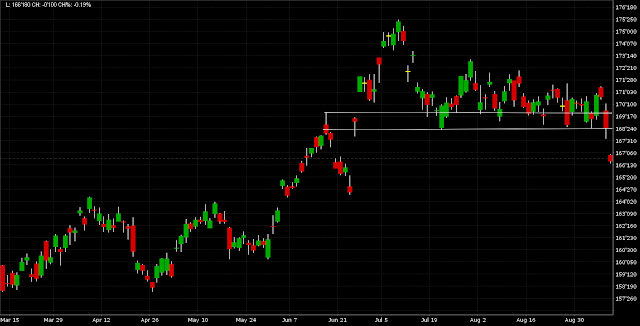 did anyone find a good argument for todays mini-reversal (more impressive intra-equity)? I'm waiting for your show up to double my short. "@Anon 4:44 - I feel that today is a 'generational buying opportunity'. In my 13 mths of institutional experience I've rarely seen such a bullish opportunity as this..."
12yoHFM - you are a genius. if ever they were going to make a rerun of Max Headroom (a UK TV prog in the 1980's when your parents were born) based on a CNBC character you should be it. Superb script. 12yoHFM .. are you on twitter? I want to follow.. If not please start up. Pol. It's all Snapchat of P&L and Instagram of his spoils. I think equities and bonds wont go back to low correlation, or at least as much as they've perhaps been before. They'll continue to go the same way. Simply because today equities rising doesn't have to mean at all that fundamentals are improving and vice versa and hence bonds should be going down. Currently it's much more about low yields are good and high yields are bad for the TINA narrative. And when one looks at banks "analysis" for the retail crowd it's pretty much all their arguments are based on: bc CB's will buy everything and the alternative is crap. To me it looks like TINA is the single most crucial base on which everything else has been leveraged. And I think that's basically my own (more or less stereotypical representative of the retail crowd, I think) and many others basis on holding equities. The valuations by themselves are terrible considering the risks to growth. This certainly looks like there is a CB narrative fatigue, where now even moderately dovish is regarded as hawkish. The standards of expectations are changing. And indeed it's also mathematics, as the debt base gets larger you simply need more nominal debt to keep the same growth rate (larger QE). Draghi again whined that every country that has fiscal room should do everything they can on that aspect. The more likely it is probably the less reason to own equities. I don't think fiscal stimulus will have a long lasting effect on the economy as most of the potential things it probably would be concentrated on will not be anything productive in the long term but rather a one time waste, but it might certainly be on the play book menu. Brainard is out in January. No way she is ever voting for a hike. It's widely expected she will dissent if there was a vote for a hike. Market gonna do what market gonna do. was kicking myself for covering some of my short on Friday. now i'm kicking myself for putting some of it back in this morning. great! Interesting day. Lucky, so far. Exited SPY put spread and got long EM risk earlier, when it didn't look like massive, technically-driven selling was coming through. Was also willing to bet that Brainard wouldn't swerve hawkish, too. That was an easy bet. The nail-biter was and still is the long end. The breakout there is clear and is the real Damocles sword hanging over markets, IMO. Receiving rates in EM seems a good bet to me (EM inflation is going down and there's room for rates to fall), as does long Chinese H shares, but both (especially the former) need DM long rates to behave (the Fed will take care of the short end). I don't see much reason to own or short the US market here. Interesting post by Celeriac1972 @ 2:58. Punters are missing the real action today. It's not what the equity markets think about Lael Brainerd being Lael Brainerd. The real action is in the bond market. Treasuries didn't catch a bid today. Bonds were selling off globally - and they are going to continue to sell off - b/c of what the BoJ and ECB are NOT going to do, irrespective of what the FED is or is not going to do. 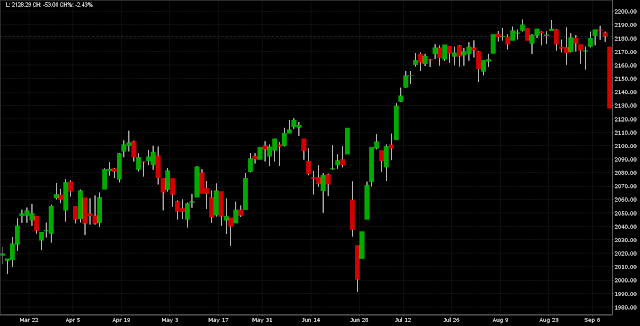 Equities will eventually follow suit. In addition, the Fed can and will use this September meeting to signal that December is ON, no matter what (in an echo of last year). 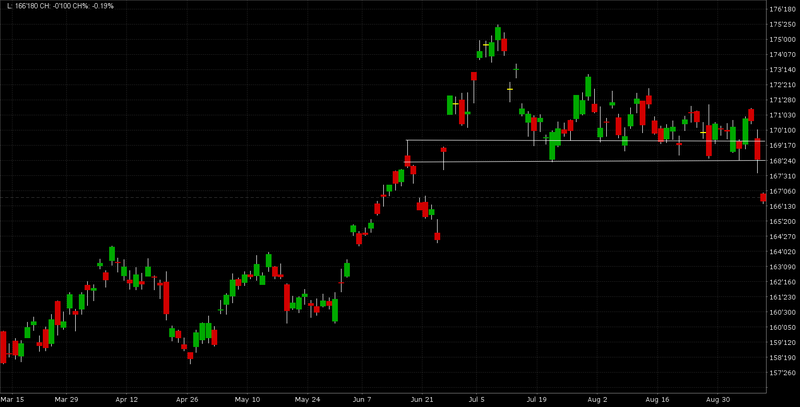 Higher long end rates and a firm tone in the dollar will bring this equity market down, September hike or no hike. Then there is the issue of the mysteriously fainting Democratic presidential nominee, which is becoming a real concern at this point. The shocker (or is it already old news?) for bonds could come from a BoJ steepening policy. Reuters has been the best source on the BoJ for some time now, and they're reporting BoJ is studying several options to steepen the curve. 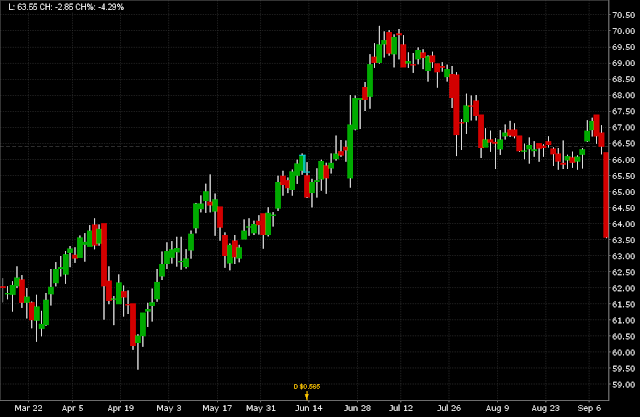 Kuroda and Nakaso have talked about the need for a steeper curve since July, or so I understand. Already, there's evidence of a shift: BoJ planned September purchases for >10 year maturities is down materially from January. Meanwhile there's talk of the government expanding ultra-long issuance. How much is already in the price? I don't know, but tonight's 20Y JGB auction will be interesting. @johno - that is s splendid - after failing miserably at the test (getting inflation up via perpetual QE and NIRP) BoJ wants to doctor the report card (the steepness of the yield curve) directly. Unlike fiscal stimulus, this wouldn't even pass the laugh test - didn't a courageous central banker whose name escapes me, try the very opposite of that (operation twist)? I believe next they will massage the yield curve into a sine wave, then white noise, and then finally a dot. So our PnL is back on track, and we're attracting quite a lot of investor interest. Following questions re: our methodology and ability to produce alpha, I'd like to quote Downtown Josh Brown who earlier summed it all up rather nicely: "If the entire market is being driven by PhD geniuses and their algorithms, then the only edge available is to be stupid." Word up. We remain long spooz (SPX target 5000) - models and bottles bitchez. @LB - I'm no expert on FI (still on Ch2 of Fabozzi) but why would a sell-off in JP sov debt necessarily be negative for US equities? Firstly the Japanese attempt to steepen the yield curve might entail bolstering asset purchases of corp bonds and ETFs (both domestic & froeign), and secondly even if a bond tantrum emerged (a la 2013 & 2015) might this not cause investors to flee to the safety of Nasdaq biotech stocks and the like? Latest Hilsenrath article at WSJ: "Divided Federal Reserve Is Inclined to Stand Pat....Federal Reserve officials, lacking a strong consensus for action a week before their next policy meeting, are leaning toward waiting until late in the year before raising short-term interest rates. It is a close call. But with inflation holding below the Fed’s 2% target and the unemployment rate little changed in recent months, senior officials feel little sense of urgency about moving and an inclination toward delay, according to their public comments and recent interviews." 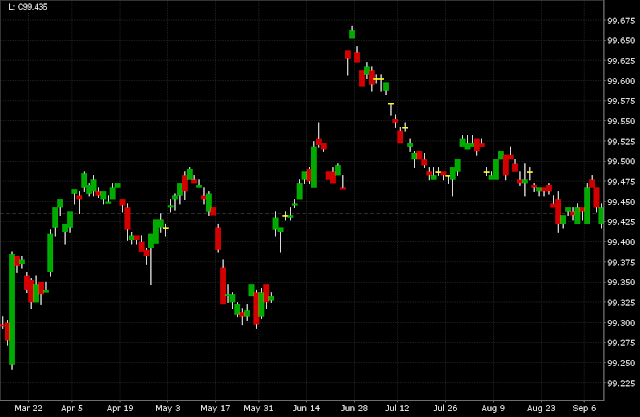 A steepening of Jap yields would be a POSITIVE for all equities, imo.